Can Apple Breathe New Life into the Moribund TV Market? By offering a complete television solution that seamlessly integrates the three key elements of display, user interface—and most importantly content—Apple Inc. has the opportunity to develop a lucrative new business model that could allow it to cut a profit despite the weak market conditions of the TV market, according to new IHS iSuppli Home & Consumer Electronics research from information and analysis provider IHS (NYSE: IHS). Rumors and press reports indicate that Apple is planning a television product. While conjecture on the nature of this product varies widely, IHS speculates that Apple could achieve success by offering a complete television solution. This is partly because such a product would be simple to utilize and functional right out of the box, in keeping with Apple’s user-friendly approach to hardware. However, it also would allow Apple to integrate access to pay television right into the TV, differentiating the product from the competition, and allowing the company to tap into the expanding market for subscription revenue. Apple could do this either by expanding its existing iTunes services, or by partnering with pay TV providers to deliver programming via cable, satellite or other means. Such a partnering deal could be critical to the success of Apple’s television and could serve to reshape the television business, much in the same way the company has revolutionized the music market with iTunes. Apple’s rumored product announcement comes during a time of weakening conditions in the global television business. After riding high during the flat-panel replacement wave of the 2000s, the growth of television unit shipments has slowed, impacting market revenue. Having frequently risen by double-digit percentages in the mid to late 2000s, global television shipment revenue growth will slow to the low single digits in 2011 and 2012, will stagnate in 2013 and actually will decline in 2014 and 2015. In contrast, global pay television subscription revenue is expected to continue to rise in the coming years. Although growth will slow somewhat, revenue still is set to expand by a healthy 5 percent in 2015. 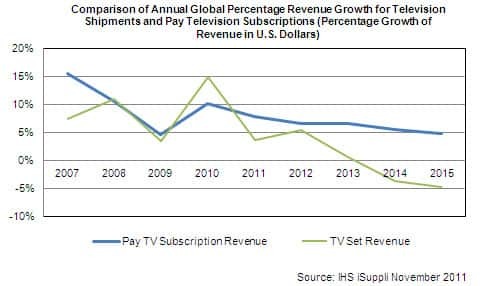 The figure below contrasts the IHS forecasts of global revenue growth for televisions and for pay TV subscribers. Meanwhile, the already thin margins are dwindling in the television market, making it increasingly difficult to cut a profit. IHS speculates the product may be at least a 50-inch set using liquid crystal television display technology. The panel represents the most expensive component of an LCD TV. However, the large-sized LCD market is currently in a state of oversupply that may worsen over time, making such panels increasingly affordable when the Apple television begins shipping, which is rumored to be in late 2012. Combined with Apple’s capability to manage the supply chain to obtain optimal pricing, the company should be product the set at a competitive cost. The Apple television would also likely integrate the electronics from Apple TV set-top box into the television chassis. A critical feature of the Apple television will be the user interface. Press reports indicate Apple plans to use the Siri voice recognition software first employed in the iPhone 4S smartphone. This will bring revolutionary ease of use to the set, allowing users to eschew complex, easy-to-lose remote controls and instead employ voice commands using natural language. A possible course of action for Apple to provide the third-piece of the puzzle—the content—Apple may choose to partner with pay TV providers, such as cable operators. The most likely partner candidates for Apple in the United States and Europe would be the cable service operators. Similar to the cellphone market, consumers may be able to lease or purchase Apple’s television from a cable operator at a subsidized price. However, Apple may face major challenges in trying to sort out the technical and business issues related to such a partnership, noted Tom Morrod, head of television technology for IHS. One challenge is the fragmented nature of the pay TV market, with a multitude of operators with unique conditional access systems dividing up countries and regions. The fragmentation of the market is the reason why the cable and satellite set-top box business exists today, making it possible for any television to interface with the plethora of systems populating the pay TV market. To address multiple pay TV operators, Apple likely would have to produce multiple versions of its television. This would be a time-intensive process, requiring as much as six months to year of development to each operator. Finally, Apple’s move into the content side of the television market may represent an incursion into the pay TV operators’ traditional territory, reducing their incentive to enter a partnership. “Apple may benefit from controlling the pay TV ecosystem—but it’s critical for cable operators to control that ecosystem,” Morrod said. “The television market is different from the mobile handset market. In the phone market, wireless coverage is a commodity—so Apple’s iPhone had an opportunity to create differentiation. However, the content services operated by the cable operators are the differentiator. There’s less need to differentiate on the hardware, and more benefits to find innovative services and application, like digital video recording (DVR). However, unless Apple can find and monopolize one such service, there is little incentive to share subscription revenue with a hardware maker like Apple.” Apple in the past has shown an unparalleled skill at managing the complexities and pitfalls of partnering with content providers. This is most notable in its agreements with music publishers to create iTunes, and its deals with publishers to provide access to newspapers and other periodicals on the iPad. “Given its history of success, Apple is really the only company that can strike a deal with the pay TV providers to make a truly integrated television product—complete with content,” Lawson said. However, if these challenges prove insurmountable, Apple has an alternative route to delivering an integrated TV product.